Diabetes Mellitus has been a public health issue and more so for developing countries as they are still struggling with infectious diseases. Hence, developing countries are bearing the double brunt of persistent infectious diseases and rising noninfectious diseases. As per International Diabetes Federation (IDF) diabetes prevalence data, there were 425 million adults with diabetes worldwide in 2017, which is expected to rise to 629 million by 2045. India is home to 72.9 million people with diabetes. Patients with diabetes need to achieve good glycemic control to prevent or delay the complications related to diabetes., As far as the treatment is concerned, there are limited classes of drugs available for oral use in diabetes patients. Most importantly, the drugs used for glycemic control are either associated with weight gain or they are weight neutral., With the introduction of SGLT2i, diabetes treatment has taken a new turn. Not only these drugs lead to good glycaemic control, they have shown a benefit of weight reduction as well. Dapagliflozin, canagliflozin, and empagliflozin are three SGLT2i, which are FDA approved and are currently available for clinical use in India. They are recommended as options for treatment of patients with type 2 diabetes as monotherapy or in combination with other antidiabetic drugs. There are many randomized trials and prospective trials to show good glycemic control and weight reduction benefits.,, Genitourinary infection is the most commonly reported adverse effect with SGLT2i use in clinical trials. People with diabetes are already at increased risk of genitourinary infections and use of SGLT2i might add significantly to this problem. Real-world data on SGLT2i use are very limited and have focussed mainly on effectiveness.,, Real-world data are essential to ascertain if the safety and efficacy results of SGLT2i seen in clinical trials can be extrapolated to clinical practice. We designed this prospective observational study with the primary objective to evaluate the adverse effect profile of SGLT2i and secondary objective to see the effect on glycemic control and weight loss in patients with type 2 diabetes in real-world clinical practice. This was an observational prospective longitudinal study, conducted in Outpatient Department of Endocrinology and Diabetes at a tertiary care center. All consecutive type 2 diabetes patients initiated on SGLT2i in outpatient department by a single consultant from 1 April 2015 to 31 March 2016, were included in the study. SGLT2i were prescribed to patients with type 2 diabetes who were obese (BMI >25 kg/m 2) and/or had suboptimal glycemic control (HbA1c >7%) on oral medications ± insulin. Additionally, obese type 2 diabetes patients with good glycemic control (HbA1c ≤7%), but were struggling to lose weight, were also prescribed SGLT2i. Patients with deranged renal function tests (RFTs), liver function tests, history of recurrent genitourinary tract infections, and pregnant and lactating women were excluded. As per routine protocol, every patient visited diabetes educator after getting final prescription and was instructed about maintaining hydration and good personal hygiene. Informed written consent was obtained from all the patients. Ethical clearance was obtained from institutional review board. Follow-up data were collected at 0-, 1-, 3-, 6-, 9-, and 12-month follow-up. General physical examination and weight monitoring was done at each visit. Adverse effect profile was collected as per patient reporting and on positive questioning. All patients were encouraged to do self monitoring of blood glucose at home. HbA1c was done at 0, 3, 6, 9, and 12 months. HbA1c was analyzed by high-performance liquid chromatography method using Bio-Rad D10 analyzer. RFT was done at 0, 1, 6, and 12 months. Urine routine microscopy followed by culture sensitivity was done in patients with symptoms suggestive of urinary tract infection (UTI). Genital infections were diagnosed by patient reported symptoms and clinical examination. If patients did not come for follow-up for 6 months, they were contacted telephonically. Adverse effects were considered severe when clinical decision was taken to stop SGLT2i permanently, mild to moderate when SGLT2i were continued, or stopped temporarily. Patients were prescribed any one of the three available SGLT2i: Dapagliflozin, Empagliflozin, or Canagliflozin. We analyzed the efficacy and adverse effect profile as a class effect rather than individual drug effect. Statistical analysis was done using SPSS window version 14.0. Continuous variables are expressed as mean ± standard deviation. Paired t-test was used to compare variables at different time intervals. Univariate logistic regression analysis used to test the effect of different variable on outcome. Significance level was set at P < 0.05. In total, 486 patients were initiated on SGLT2i [Figure 1]. 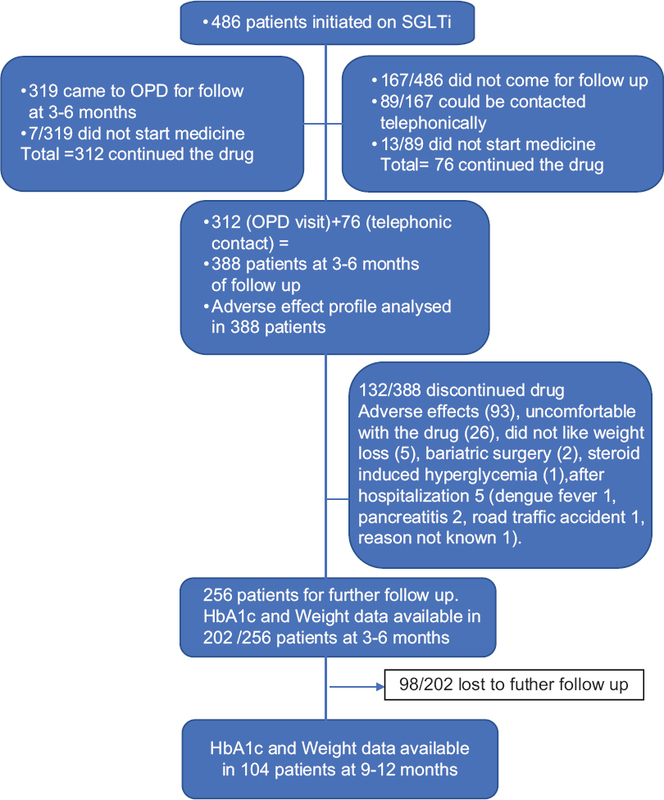 Overall, 319 patients came for at least one follow-up between 3 and 6 months. Out of 319 patients who came for follow-up, 7 patients did not start medicine (malignancy 1, Hepatitis 1, did not want to try new drug 5), so there were 312 patients for further follow-up. Out of 167 patients who did not come for follow-up, 89 patients gave information telephonically, whereas 78 could not be contacted. Out of 89 patients contacted telephonically, 13 patients did not start medicine. Therefore, there were total 388 patients for analysis at 6 months out of which 268 were males and 120 were females. Baseline characteristics are given in [Table 1]. 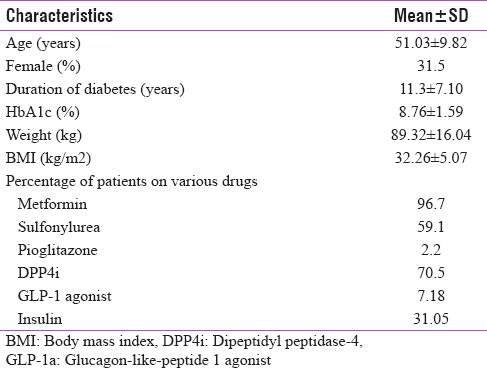 Baseline antidiabetic drugs used in these patients is shown in [Table 2]. 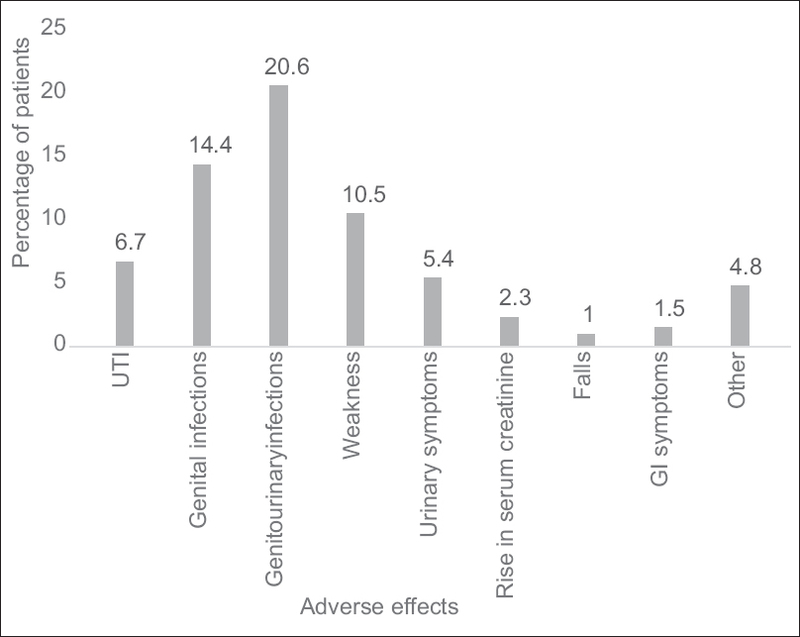 Genitourinary tract infections: This was the most common adverse effect seen [Table 3]. About 80 (20.6%) patients suffered at least one episode of genitourinary tract infection out of 388 patients. These were much higher in females (27.5%) as compared with males (17.5%). About 18.3% females suffered from vulvovaginitis, whereas 12.7% male patients suffered from balanoposthitis. About 10.83% females had UTI and all episodes were severe, leading to discontinuation of SGLT2i, whereas 0.7% males had mild to moderate and 4.1% had severe UTI. Mild-to-moderate infections were treated with topical or oral antibiotics. Weakness and lethargy: This was the second most common adverse effect after genitourinary infection, reported by patients in absence of hypoglycemia or hypotension. Overall, 41 (10.5%) patients themselves came with the complaint and it led to discontinuation of SGLT2i in 13 (3.3%) patients. Urinary symptoms: Twenty-one patients complained of disturbing urinary symptoms in the form of increase frequency of urination, nocturia, urinary urgency, and urge incontinence. Alteration in RFT: Five patients had rise in blood urea and creatinine levels within 1 month of starting drug, where drug was discontinued (it was secondary to gastroenteritis and fever in two patients). Serum creatinine levels gradually increased in three more patients over 12 months. Serum creatinine (mg/dL) in these patients at 6 months was 0.99, 1.1, 1.18 and at 12 months was 1.7, 1.23, 1.4, respectively. One patient had rise in serum creatinine level from 1.0 to 1.6 mg/dL at 1 month, which persisted over next month leading to discontinuation of SGLT2i. So, there were total nine patients with alteration in renal function. Falls: Falls were consequent to dizziness (n = 2), vertigo (n = 1), and one patient complained of reappearance of his childhood spells of transient loss of consciousness. But there was no injury. Gastrointestinal upset: Six patients complained of nausea and vomiting initially after starting treatment. Drug allergy: Drug was discontinued in two patients due to rash and itching over body. Other adverse effects: Other problems reported by patients were paraesthesias, eye problems (burning, pain, and heaviness), body aches, and leg cramps. One patient had hypercalcemia, which could not be evaluated further. Two patients developed pancreatitis. None of the patients developed diabetic ketoacidosis or severe hypoglycemia. Females had significantly higher UTI as compared with males (Chi-square value 4.5, P = 0.04; P = 0.02). Univariate analysis did not show any association between genitourinary infections and baseline HbA1c [odds ratio (OR) = 1.08, 95% confidence interval (CI): 0.9–1.2), age (OR = 0.99, 95% CI: 0.9–1.02), or duration of diabetes (OR = 0.99, 95% CI: 0.96–1.01). Similarly, multivariate analysis also did not reveal any association between genitourinary infections and baseline HbA1c (OR = 1.1 95% CI: 0.9–1.3), age (OR = 1.0, 95% CI: 0.9–1.05), or duration of diabetes (OR = 1.0, 95% CI: 0.96–1.09). Total 93/388 (23.9%) patients discontinued drug due to adverse effects [genitourinary infections (61), weakness (13), alteration in KFT (6), urinary symptoms (4), GI upset (2), drug allergy (2), falls (2), joint pains (1), night time hypoglycemia (1), and paraesthesia (1)]. HbA1c and weight data were available in 202 patients at 3–6 months and 104 patients at 9–12 months of follow-up. There was significant reduction in weight from baseline, with mean weight loss of 3.2 kg at 3–6 months and 3.9 kg at 9–12 months (P < 0.05). Mean reduction in HbA1c at 3–6 months was 1.26% and at 9–12 months was 1.27%, which was statistically significant for both the intervals (P < 0.05) [Table 4]. At baseline, only 9.6% patients had HbA1c ≤7.0% and 57.4% patients had HbA1c value ≥8.0%. On follow-up, 37.4% patients achieved HbA1c ≤7.0% and 79.3% achieved ≤8.0%. HbA1c and weight at 6 and 12 months were not correlated with baseline HbA1c, weight, age, and duration of diabetes. Achieving good glycemic control is an important step in diabetes management to prevent diabetes-associated complications. Metformin has been the first line drug for many years. DPP4i have become the second choice drug for physicians because of its weight neutral effect and less chances of hypoglycemia. Our study also showed similar trend with DPP4i as the second most common drug used after metformin. When SGLT2i were introduced, they came as promising drugs particularly for obese people. The unique mechanism of action of SGLT2i, independent of impaired β-cell function and insulin resistance, effectively reduces HbA1c with reduced risk of hypoglycemia. Glycosuria leading to calorie loss, gives SGLT2 inhibitors the additional advantage of body weight reduction, contrary to most of the other antidiabetic agents. However, this glycosuric effect can also predispose patients to the risk of genitourinary infections. Genital tract infections (GTI), mainly mycotic balanitis and vulvovaginitis, are the most frequent reported adverse events of SGLTi use. In a meta-analysis, an increased incidence of GTIs with SGLT2i versus placebo (odds ratio = 3.50, 95% CI = 2.46–4.99]) and active comparators (OR = 5.06, 95% CI = 3.44–7.45]) was reported; no differences were demonstrated among SGLT2i. The overall reported incidence of genital infections with SGLT2i use in clinical trials was 4%–6%, but these events were more common among women (with rates of approximately 7%–11%) than men. 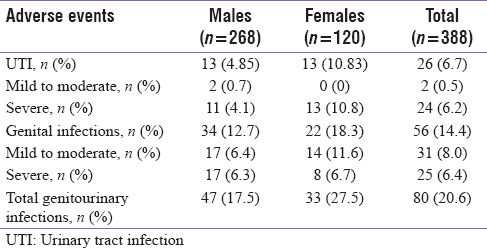 About 18.3% females in our study developed genital infections, which is much higher as compared with other western population studies., Even males in our study had higher rate of genital infections (12.7%). These episodes were either recurrent or severe enough to discontinue drug in at least 6.3% males and 6.7% of females. The reported incidence of UTIs in clinical trials ranged from 4% to 9%. In our study, 10.8% females and 4.8% males suffered from UTIs. These UTIs were significantly more common in females. All UTIs in females were severe. In Leiter et al. 's study group, only one patient had severe UTI on 100-mg canagliflozin, mild UTI episodes were reported in 10.6%, and rate of mild genital infections was 9.5% and 13.9% in males and females, respectively. Mathieu et al. 's study showed genital infection rate 5% and UTI <1% when dapagliflozin 10 mg/day added to saxagliptin plus metformin in patients with HbA1c 7%–10.5%. Most of these studies have included patients with HbA1c below 10.5%–11.5%, whereas we had patients with all ranges of HbA1c. Reasons for higher incidence of genitourinary infections could be uncontrolled and long-standing diabetes. However, we did not find any significant correlation between genitourinary infections and baseline age, HbA1c, or duration of diabetes. Possible explanations for higher incidence of genitourinary infections reported in our study could be hot and humid weather in our country, which can precipitate genital infections. Recent posthoc analysis of canagliflozin also showed a trend toward higher rate of UTI in hot climate countries when compared with other areas (9.5% vs 4.6% at 26 weeks of placebo-controlled period, 22.3% v 7.4% at 104 weeks of active controlled period with canagliflozin 100 mg). Second most common complaint which we noticed was feeling of weakness and lethargy and importantly this led to discontinuation of drug in 3.3% of patients. This adverse effect, particularly in the absence of hypotension and hypoglycemia, has not been described in other studies. Osmotic diuresis has been described in more than 2%–3% patients and that too in few studies., Weakness, lethargy, and dizziness seen in our patients were likely due to osmotic diuresis, which could be exaggerated due to hot and humid weather observed in our country, causing dehydration. It was already starting of summer when SGLT2 inhibitors were introduced and temperatures usually cross 45°C here during summers. HbA1c reduction seen in our study is comparable to other studies.,, Mean reduction at the end of 12 months was 1.27% and 37.4% patient achieved HbA1c ≤7.0% in our study. Mean reduction in HbA1c was 0.82% and 0.93% at 52 weeks, when canagliflozin 100 and 300 mg, respectively, were added on metformin in Leiter et al. 's study. Similarly, Schernthaner et al. 's study has shown HbA1c reduction of 1.03% when canagliflozin 300 mg added to combination of metformin and sulfonylurea in patients with HbA1c 7.0%–10.5%. About 47.6% patients achieved HbA1c <7%. In Stephan et al. 's study, HbA1c reduction was 0.69% and 31.8% patients achieved HbA1c <7% when dapagliflozin 10 mg added to metformin sulfonylurea combination. Weight reduction noted in our study is also comparable to other studies. We found a mean weight loss of 3.2 kg at 3–6 months and 3.9 kg at 9–12 months. Rosenstock et al. 's study has shown weight loss in range of 2.3–2.9 kg, when SGLT2i was used as add on to metformin. Similarly, weight loss of 2.7 kg was seen in Stephan et al. 's when SGLT2i was used as add on to metformin and sulfonylurea over 24 weeks. 1) It is a real-world study. Clinical trials are often conducted with specific populations and in specialized environments that differ from the realities of clinical settings. We presented data of an observational study conducted in a specialist run diabetes clinic of a tertiary care center, where SGLT2 inhibitors are prescribed as first, second, third, or fourth choice, there are patients from different socioeconomic strata, different age groups, and duration of diabetes and good-to-poor glycemic control. Data on safety and effectiveness of a drug in such heterogeneous population seen in clinical practice add valuable information for understanding the risks and benefits of a new drug. 2) It is a prospective study of relatively longer duration (1 year) of follow-up, which is important to demonstrate the sustained effectiveness of any drug. Limitation of our study is that we did not have the control group. Another limitation is, we did not analyze the effect on other parameters such as blood pressure and lipid profile. In light of the evidence that the SGLT2 inhibitors may reduce mortality in patients with diabetes and cardiovascular disease, these drugs are becoming increasingly popular among physicians. Therefore, patients and physicians need to be aware of the adverse effect profile of SGLT2i as well so that benefits of this promising class of drugs can be maximized by their vigilant use. Risk versus benefit should be assessed on a case-to-case basis. SGLT2i should be used cautiously in elderly, previous history or risk of UTI, patients already on diuretics and especially in countries with hot and humid weather. All patients should be educated about importance of maintaining adequate hydration and good genital hygiene. In conclusion, in this real-world study, we found a significant proportion of patients experiencing adverse effects with SGLT2i use, genitourinary infections being the most common. Effectiveness in terms of HbA1c reduction and weight loss was comparable to that reported in clinical trials. Group AC, Patel A, MacMahon S, Chalmers J, Neal B, Billot L, et al. Intensive blood glucose control and vascular outcomes in patients with type 2 diabetes. N Engl J Med 2008;358:2560-72. 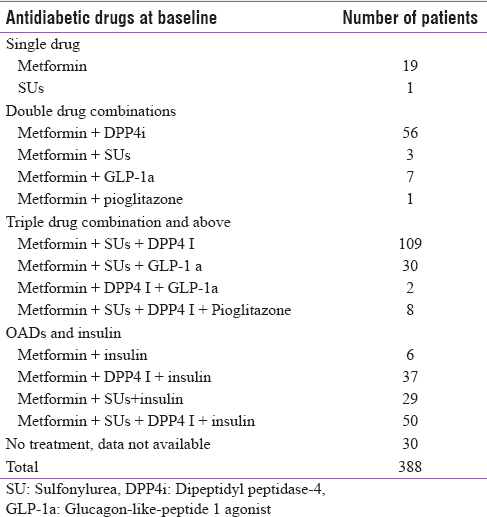 Foroutan N, Muratov S, Levine M. Safety and efficacy of dipeptidyl peptidase-4 inhibitors vs sulfonylurea in metformin-based combination therapy for type 2 diabetes mellitus: Systematic review and meta-analysis. Clin Invest Med 2016;39:E48-62. Gross JL, Kramer CK, Leitao CB, Hawkins N, Viana LV, Schaan BD, et al. Effect of antihyperglycemic agents added to metformin and a sulfonylurea on glycemic control and weight gain in type 2 diabetes: A network meta-analysis. Ann Intern Med 2011;154:672-9. Bakris GL, Fonseca VA, Sharma K, Wright EM. Renal sodium-glucose transport: Role in diabetes mellitus and potential clinical implications. Kidney Int 2009;75:1272-7. Hediger MA, Rhoads DB. Molecular physiology of sodium-glucose cotransporters. Physiol Rev 1994;74:993-1026. Wright EM, Turk E. The sodium/glucose cotransport family SLC5. Pflugers Arch 2004;447:510-8. Komoroski B, Vachharajani N, Boulton D, Kornhauser D, Geraldes M, Li L, et al. Dapagliflozin, a novel SGLT2 inhibitor, induces dose-dependent glucosuria in healthy subjects. Clin Pharmacol Ther 2009;85:520-6. Liu JJ, Lee T, DeFronzo RA. Why Do SGLT2 inhibitors inhibit only 30-50% of renal glucose reabsorption in humans? Diabetes. 2012;61:2199-204. Ribola FA, Cancado FB, Schoueri JH, De Toni VF, Medeiros VH, Feder D. Effects of SGLT2 inhibitors on weight loss in patients with type 2 diabetes mellitus. Eur Rev Med Pharmacol Sci 2017;21:199-211. American Diabetes A. 8. Pharmacologic approaches to glycemic treatment: Standards of medical care in diabetes-2018. Diabetes Care 2018;41:S73-S85. Bailey CJ, Gross JL, Pieters A, Bastien A, List JF. Effect of dapagliflozin in patients with type 2 diabetes who have inadequate glycaemic control with metformin: A randomised, double-blind, placebo-controlled trial. Lancet 2010;375:2223-33. Vasilakou D, Karagiannis T, Athanasiadou E, Mainou M, Liakos A, Bekiari E, et al. Sodium-glucose cotransporter 2 inhibitors for type 2 diabetes: A systematic review and meta-analysis. Ann Intern Med 2013;159:262-74. Softeland E, Meier JJ, Vangen B, Toorawa R, Maldonado-Lutomirsky M, Broedl UC. Empagliflozin as add-on therapy in patients with type 2 diabetes inadequately controlled with linagliptin and metformin: A 24-week randomized, double-blind, parallel-group trial. Diabetes Care 2017;40:201-9. Liu J, Li L, Li S, Jia P, Deng K, Chen W, et al. Effects of SGLT2 inhibitors on UTIs and genital infections in type 2 diabetes mellitus: A systematic review and meta-analysis. Sci Rep 2017;7:2824. McGovern A, Feher M, Munro N, de Lusignan S. Sodium-Glucose Co-Transporter 2 (SGLT2) Inhibitor: Comparing trial data and real-world use. Diabetes Ther 2017;8:365-76. Tamez-Perez HE, Delgadillo-Esteban E, Soni-Duque D, Hernandez-Coria MI, Tamez-Pena AL. SGLT2 inhibitors as add on therapy in type 2 diabetes: A real world study. J Diabetes Metab Disord 2017;16:27. Kosiborod M, Cavender MA, Fu AZ, Wilding JP, Khunti K, Holl RW, et al. Lower risk of heart failure and death in patients initiated on sodium-glucose cotransporter-2 inhibitors versus other glucose-lowering drugs: The CVD-REAL study (Comparative Effectiveness of Cardiovascular Outcomes in New Users of Sodium-Glucose Cotransporter-2 Inhibitors). Circulation 2017;136:249-59. Tanabe M, Motonaga R, Terawaki Y, Nomiyama T, Yanase T. Prescription of oral hypoglycemic agents for patients with type 2 diabetes mellitus: A retrospective cohort study using a Japanese hospital database. J Diabetes Invest 2017;8:227-34. Leiter LA, Langslet G, Vijapurkar U, Davies MJ, Canovatchel W. Simultaneous reduction in both HbA1c and body weight with canagliflozin versus glimepiride in patients with type 2 diabetes on metformin. Diabetes Ther 2016;7:269-78. Mathieu C, Ranetti AE, Li D, Ekholm E, Cook W, Hirshberg B, et al. Randomized, double-blind, phase 3 trial of triple therapy with dapagliflozin add-on to saxagliptin plus metformin in type 2 diabetes. Diabetes Care 2015;38:2009-17. John M, Cerdas S, Violante R, Deerochanawong C, Hassanein M, Slee A, et al. Efficacy and safety of canagliflozin in patients with type 2 diabetes mellitus living in hot climates. Int J Clin Pract 2016;70:775-85. Cefalu WT, Leiter LA, Yoon KH, Arias P, Niskanen L, Xie J, et al. Efficacy and safety of canagliflozin versus glimepiride in patients with type 2 diabetes inadequately controlled with metformin (CANTATA-SU): 52 week results from a randomised, double-blind, phase 3 non-inferiority trial. Lancet 2013;382:941-50. Weir MR, Januszewicz A, Gilbert RE, Vijapurkar U, Kline I, Fung A, et al. Effect of canagliflozin on blood pressure and adverse events related to osmotic diuresis and reduced intravascular volume in patients with type 2 diabetes mellitus. J Clin Hypertens (Greenwich) 2014;16:875-82. Matthaei S, Bowering K, Rohwedder K, Grohl A, Parikh S, Study G. Dapagliflozin improves glycemic control and reduces body weight as add-on therapy to metformin plus sulfonylurea: A 24-week randomized, double-blind clinical trial. Diabetes Care 2015;38:365-72. Schernthaner G, Gross JL, Rosenstock J, Guarisco M, Fu M, Yee J, et al. Canagliflozin compared with sitagliptin for patients with type 2 diabetes who do not have adequate glycemic control with metformin plus sulfonylurea: A 52-week randomized trial. Diabetes Care 2013;36:2508-15.